It is June 1st and the Yankees are still in first place of the AL East and have a chance to increase their lead tonight. The Yankees went 3-3 over the last week, winning the series against the A’s at home, before dropping a couple of games at Camden Yards against the O’s. The Yankees offense is still struggling to put up runs on the board consistently, but are being bailed out by their pitching. The offense had an outburst on Tuesday night, before cooling off last night and leaving many runners on base. The rotation put up a couple of good starts in the last week, but one hole that had a chance to solve itself, has not solved itself. The offense led by Aaron Judge and Starlin Castro continue to keep the Yankees in every game, and even despite the starter giving up seven runs yesterday, they were still in the game the whole time. Judge and Castro are on pace to be All-Stars and there is a chance they will be joined by others. Matt Holliday and Brett Gardner are among the hottest hitters in baseball right now and they carried the team to a win on Tuesday night. Judge, is currently the front runner to win the AL MVP after the injury to Mike Trout, continues to prove all his doubters wrong and might end up having a season that will be remembered forever. 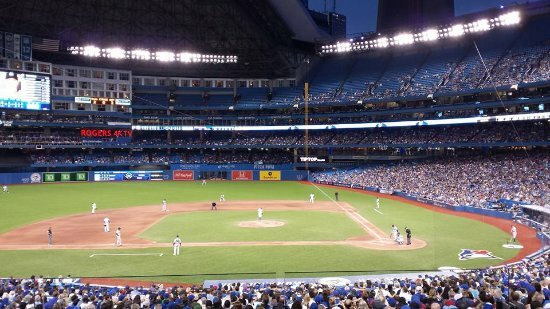 The Yankees will take on the Toronto Blue Jays for a four game set this weekend at the Rogers Centre in Toronto. They are playing in a hitter friendly park this weekend before they return home, so the offense has a chance to steal a couple of games, when the starter is struggling. Masahiro Tanaka put up a great start last Friday, before struggling once again last night. Tanaka continues to not pitch like he should and the team is saying that he is not injured, which makes this skid even more surprising. I believe the Yankees should just skip a start with him and bring up someone from AAA. Chance Adams is dominating AAA, and is the perfect replacement for Tanaka in case the Yankees decide to skip his start. The rotation outside of Tanaka continues to put up good starts outside of a couple of outliers. Tanaka will not be pitching this series, so the Yankees are putting up their best four starters. The Blue Jays really struggled in the first few weeks of the season, but are getting better and healthier. The Jays are still in last place and the Yankees have a chance to put in the last nail in their coffin. If the Yankees sweep this series, I do not see any possibility of them making up the deficit. I think the Yankees will take three out of four games this series before returning home to face the Red Sox.